If you get the feeling that the cost of replacing the ink cartridges on your inkjet printer is getting out of hand, your impression may be more accurate than you realize. Between 2009 and today, the rate of inflation has increased by 7 percent. During that same period, the cost per page of some vendors' inks has risen by anywhere from 4 percent to 30 percent. Yes, 30 percent. We review 50 or more printers per year, and we price the cartridges for every one of them. About 8 months ago, I began noticing that ink cartridge prices for some models were going up--sometimes sharply. When I dug deeper, I also saw that the price increases seemed to be selective: Some inks went up; others stayed the same; and one even dipped slightly. 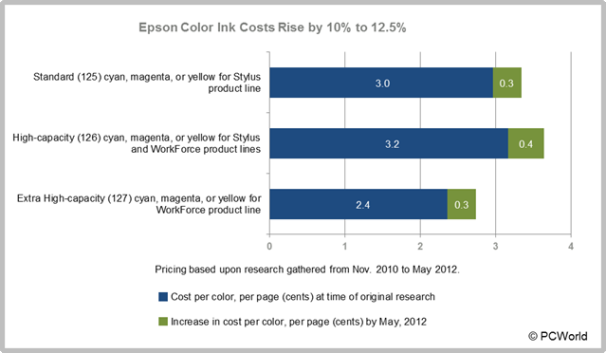 The biggest hikes I observed came from Lexmark and Kodak, but Epson's color ink costs have been rising as well. 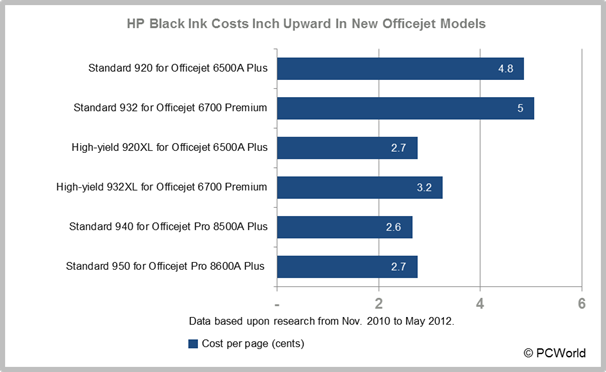 Meanwhile, HP seems to be nudging ink costs upward in its newer models. Most vendors declined to comment on my findings. 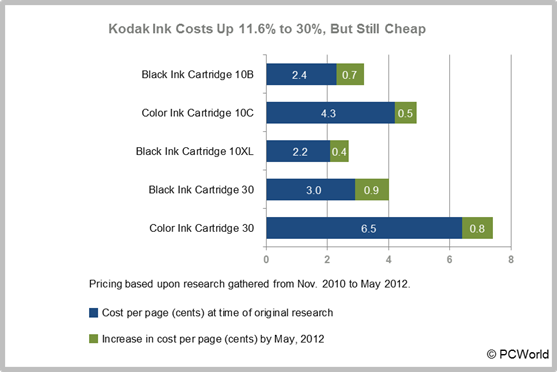 Only Kodak readily acknowledged the price changes, noting that its inks were still among the cheapest available. 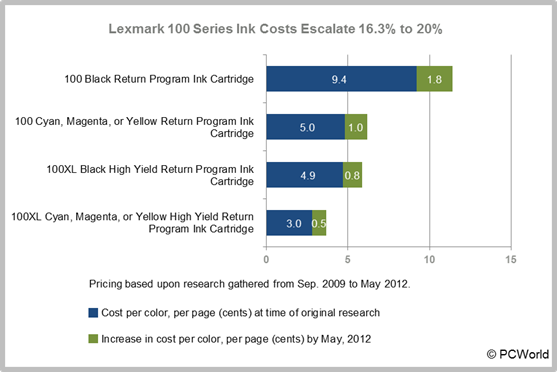 Lexmark's printers are getting better, but unfortunately its ink prices are getting higher, too. From 2009 to the present, I tracked price increases on the company's 100 and 100XL lines of ink cartridges, which are used by the cool-looking Genesis, the consumer-oriented Interact S605, and the small-office Pinnacle Pro901 and Platinum Pro905. The basic Black Return Program Ink Cartridge, for instance, cost $16 in 2009 and is $19 now. Since the cartridge's yield didn't change, its cost per page jumped from an already exorbitant 9.4 cents per page in 2009 to 11.2 cents per page now. To Lexmark's credit, it still sells the 105XL, a $5, 510-page black ink cartridge that is a true bargain at less than a penny per page. Alas, it's compatible only with the Platinum Pro905, the Pinnacle Pro901, and the Prestige Pro805 (we have not reviewed the latter product). Kodak's inks remain among the least-expensive available, but within the last year the company has raised prices on all of its supplies. Its 30XL high-yield color cartridge's cost per page went up by just 4.8 percent, from 6.2 cents per page to 6.5 cents per page. But all of the others increased by between 11.6 percent and 30 percent. The two biggest jumps were for black ink: the company's 10B and 30 black cartridges rose in cost per page by 29 percent and 30 percent, respectively. Epson has raised the prices of inks in its 124, 125, 126, and 127 cartridge lines--used by popular Stylus and Workforce models, including the recent Stylus NX430 and Workforce 845. From late 2010 to now, all of the black inks' prices have increased by a reasonable 4 percent to 5 percent. Meanwhile, the costs per page for colors have shot up by 10 percent to 12.5 percent. Contrarily, the price of the company's 124 Moderate-Capacity Black ink cartridge dropped a bit, from $8.54 to $8.49 during the same period. That small decrease does little to balance out the increased cost of the color inks for the same product line, unfortunately. HP's ink prices are an interesting case. The prices of its ink cartridges tend to remain steady over time. I noticed, however, that when a new printer model replaced an old one, the new one often used a different type of cartridge--and the new cartridges cost a little bit more. In other instances, the new printer model's cartridges cost the same as the older one's cartridges, but the yield changed--sometimes for the worse. For instance, the standard-size 920 black ink for the HP Officejet 6500A costs the same as the 932 black ink for the Officejet 6500A's successor, the HP Officejet 6700 Premium. But the 932 cartridge's yield is lower: 400 pages, compared to 420 pages for the 920 cartridge. As a result, the newer printer's cost per page for standard-size black is a little higher--5.0 cents per page, versus 4.8 cents per page for its predecessor. There is a brighter side to this particular sequence: Though the Officejet 6700 Premium's color cartridges cost more than the Officejet 6500A's, their yields are also higher, so the cost per page remains essentially unchanged from generation to generation in this instance. I lacked sufficient data for two vendors: Brother and Dell. 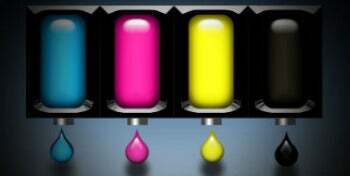 Brother's inks are sold by third parties, and their prices can vary widely. Dell's prices seem to be stable for the few printers we've reviewed; however, their inks tend to be among the priciest in cost per page. Is there any safe haven from ink-price inflation? Canon uses the same ink cartridges across many models of printers and many generations of those printers. The company's prices seem to be the most stable overall. Canon's costs per page tend to be about average, though its lower-priced printers (not surprisingly) have higher-cost inks. Regardless of which printer you own, it never hurts to shop around for the lowest-cost source for replacement inks—which may not be the printer vendor's own Web store. If third-party inks start to look like a better deal, check out our experiences with refilled and remanufactured inks before you go that route.